Ever since the last game in the series, Brawl, Masahiro Sakurai and the team behind Super Smash Bros. have used a novel way of both keeping people informed about the games’ progress and keeping interest high: Every weekday, they would reveal some small tidbit of information about the upcoming title. This could include music tracks, stage reveals, even the unveiling of new characters. This process became even easier with the transition to the Nintendo Miiverse, since it gave Sakurai a dedicated page to post new screenshots and info each week. However, with the Japanese launch of the game, it won’t be long until everyone will know exactly what is in the newest Smash. Since there’s no longer any reason to keep so much secrecy, the Nintendo Treehouse posted a marathon, 8-hour gaming stream on Friday. While a few other upcoming titles were shown off at the beginning, the main event of the stream was clearly to show off the 3DS version of Super Smash Bros. It was a task the team took to with great enthusiasm, showing off many of the game’s modes and new features. Since the majority of us in the West (other than Platinum Club Nintendo members) will have to wait until next week to get our hands on a demo, here are some of the newest details about the upcoming game, just to whet your appetite. In prior Smash Bros. games, the most customization players could hope for when it came to the combatants was switching between a few palette swaps. However, during development of the newest games, it was announced that players would be able customize to a much greater degree, with the biggest surprise coming from E3 this year. Miis, the lovable little avatars of family members and celebrities, will be available as fighters, and its unlikely that any two will ever play exactly the same. Mii fighters are broken up into three classes (Gunner, Brawler, and Swordsman) and each class has three different special moves that will available for each potential slot. This gives 36 different moveset combinations alone, but the customization options take off to ludicrous heights when you consider the costume and equipment options. Pretty much every mode in the game gives players the opportunity to unlock cosmetic costumes for their fighters, which will make for some epic ninja vs. pirate battles, I’m sure. 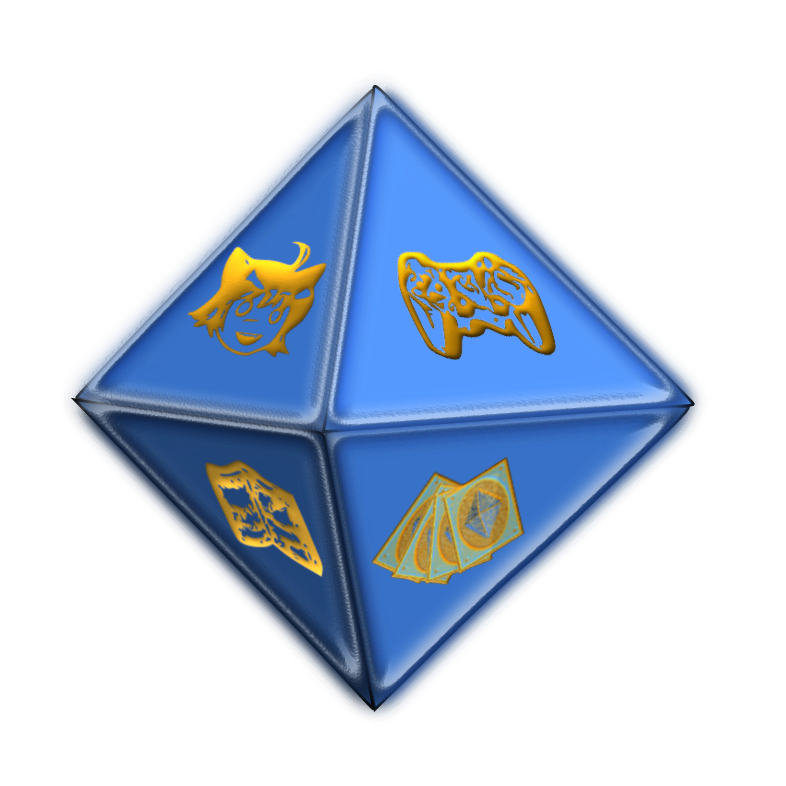 Additionally, players will find pieces of equipment that, while not appearing on your character visually, will still greatly influence your stats. Whether you want your Mii to be a quick speedster or a heavy-hitting bruiser, you’ll be able to tailor your characters to your liking. 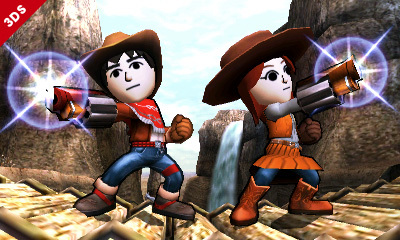 Outside of the Miis, the standard roster of Smash combatants are also getting in on the customization. While not available at the outset, players will be able to earn variations of each character’s special moves, which greatly alter each fighter’s play style. Peach’s down + B move, which ordinarily summons Toad to be used as a meat shield, can be changed so that the little guy spews out a cloud of poison gas, instead. One of the Treehouse staffers said that Palutena, especially, plays completely different, depending on what moves she has equipped. While there won’t be any unlockable costumes for each standard fighter, they do have a much wider range of color swaps, which include changes in costume or even character model, for some. In addition, equipment can also be attached to these characters, as well, and will allow players to make surprising stat adjustments. If you want your Samus to be a tank, or your Bowser to be quicker, you’ll want to take a look at some of these options. Some equipment even bestows special status effects, such as making smash attacks charge faster. Its a ludicrous amount of options, and it would be overwhelming to have to make these decisions before each battle. That’s why players will be able to save several loadouts for each character, which will be selectable at the touch of a button. 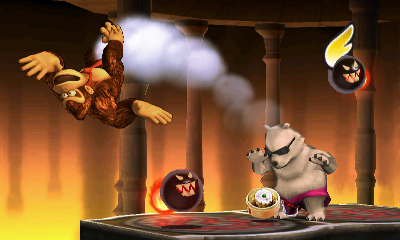 Probably the biggest change in Smash Bros. for the 3DS is the addition of the Smash Run mode. This mode will not be available in the console release, and is meant to be played online against other players. Upon starting a match, players will be warped to different parts of a large labyrinth, which reminds me a bit of Adventure mode from Melee. Players will have to run around, defeat wandering enemies, and collect power-ups. These power-ups are temporary, and will be used for the final level of the Run. Players will also be on the lookout for collectibles, like move variations, trophies, and equipment.How each player performs in the final level will determine the quality of their found treasures. Over the course of the couple of rounds that the staffers played during the stream, it was plain to see just how hectic each of these treasure hunts will be, as players have to balance the risks and rewards of taking on the larger, more powerful enemies in exchange for more loot. These enemies ran the gambit of video game history, and included the Grim Reaperr from Kid Icarus, peahats and redead from The Legend of Zelda, even some of Sonic’s robotnics. The final challenges I saw included a frantic vertical climb, as well as a 300% deathmatch, where each character would respawn with 300% damage after each death. It was gloriously chaotic, and I can’t wait to compete with others in it. While Smash Run looks like a ton of fun, it just wouldn’t be Super Smash Bros. without Classic mode, and the 3DS version is no different. However, for this iteration of the mode, Mr. Sakurai is taking a few pages from his own book. 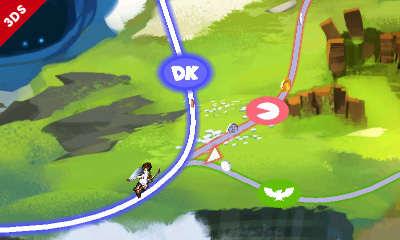 Just like in Kid Icarus: Uprising, a difficulty slider is set at the beginning of each attempt. Selecting harder difficulties requires wager a bit of coin, but the rewards increase in value dramatically. However, using a continue while playing will cause the difficulty to drop, and some of your rewards will be lost. In a particularly sadistic touch, items that you have lost will still appear, grayed out, on your results screen, just to taunt you. Progression in Classic Mode has also been revamped, and has been modeled after the RPG-lite Find Mii. Players will be able to select from numerous paths while progressing, with each leading to different fights and different rewards. During the Treehouse stream, the final boss encountered was the series’ veteran tag team of Master Hand and Crazy Hand. Upon beating one of the hands, however, a black mist appeared, and swallowed up the remaining hand. The player was then forced to take on the shadow beast, which looked a bit like a scorpion, although the staff explained that the shape of the beast would depend on the difficulty level. Wailing on the swarm for a while caused it to disapate, revealing the Master Core, which just sat there and let the player destroy it. 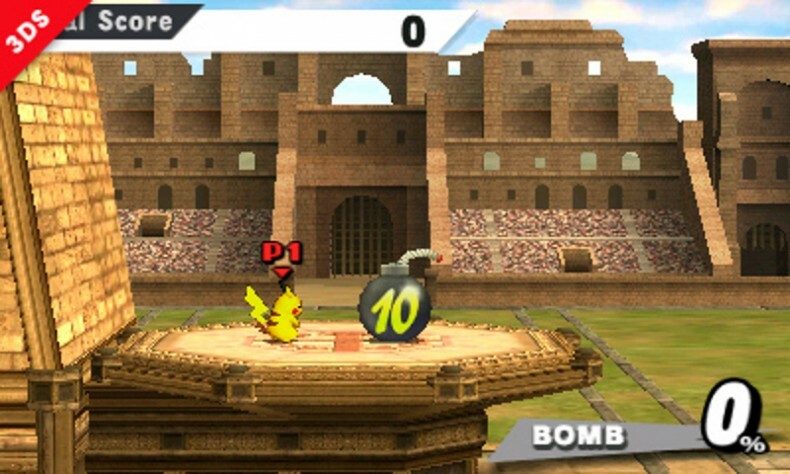 In previous titles in the series, All-Star Mode, which pit players against every fighter in sequence, was only available after unlocking every combatant. This time, though, the mode will be available from the get-go, although it will not be complete until you have all the characters. The order of encounters has also been changed a bit, as each stage of the challenge will be broken up chronologically by release date. This means that the first challenge will consist of Pac-Man, Mario, and the like. The other big change to All-Star Mode is that it can now be attempted with a buddy for the first time. Its important to remember, though, that if one of the player characters gets knocked out during a battle, its game over. In addition to the more traditional modes, several of the extra challenges were shown during the stream, some old and some new. There was Homerun Mode, where you punish a sandbag before sending it flying for distance. Multi-Man Smash also makes a return, although rather than the Fighting Polygon Team from previous entries, players will be taking on the Fighting Mii Team, which pulls from your system’s stock of created Miis. This mode comes in 10-Man, 100-Man, 3-Minute, Endless, and the distressingly titled “Cruel Smash,” which powers up the opponents, rather than the players. Target Smash also makes a return, but it appears to have gotten a face-lift. Rather than running around trying to reach all the targets as quickly as possible, players launch a bomb toward a structure that houses all the targets. The object is to break each one of them by having the structure collapse on them, and…wait a second! This is Angry Birds! They got their Angry Birds in my Smash Bros.! This will now be the most addicting thing ever! All of these modes now tie into a ranking system called your “Global Smash Power,” which, oddly enough, has nothing to do with multiplayer. Rather, it keeps track of your performance in these extra modes, and ranks you by how many players you have a higher score than, world-wide. An interesting twist, and one that will let even people who don’t put as much effort into battles still be able to compete online. The extra modes also allow players to unlock the goodies I’ve already mentioned, so even a quick Target Smash on the bus will help you to unlock new content. One mode that is more directly about these treasures is Trophy Rush, which task players with clearing out crates from a platform. The mode is timed, and it costs coins to begin, but it seems like the reward is well worth the payment. Altogether, the Treehouse’s livestream was quite successful in its purpose. I’m now more excited than ever for the new Super Smash Bros. and seeing large chunks of it in action have gone a long way toward quenching any doubts I had in a portable version of the game. When I was at Best Buy for the E3 event, I didn’t get my hands on the 3DS version, but someone told me that it had felt a bit laggy. However, in the entire stream, the game seemed to run without any hiccups, so I guess the developers have smoothed out that issue, if it was ever a problem to begin with. It was clear that the Treehouse staff had an absolute ball demoing the game, and the informal atmosphere of the presentation really helped make the entire thing more approachable. I hope that, in the future, Nintendo will continue to make presentations like these for other titles. Also, would it be too much to ask for it to be October, yet?